You can see that the leather slots follow the angle of the ball. It is a true pocket form. The slots are at tangents to an official lacrosse ball size. After you slide out the TRADiTREE and the ball sits perfectly where ever you placed the pocket. 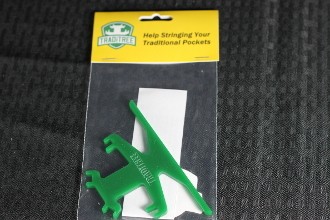 You can place the TRADiTREE on the head for a High, Mid, or a Low pocket in your traditional string job.